Floating through the abyss of space is Kerbal Space Program: First Contact, or code-name patch 0.24. It’s currently being frantically tweaked and bashed into position so it’s ready for atmosphere entry, where it will plummet down the cable lines of any existing owners and upgrade their Steam accounts with this shiny new version. 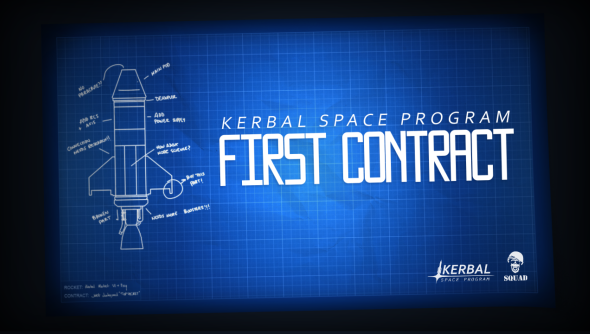 The big deal here is Contracts: a brand new way of playing Kerbal that asks you complete specific tasks in reward for financial and reputation gain. As detailed in the FAQ, Contracts will be available from Mission Control and offer a rotation of various missions to be completed for clients. Achieve the goals of the contract and you will be showered with Science, Reputation, and Funds. Funds act at the new campaign currency, and is used to budget your space program. Reputation dictates what contracts are made available to you: successfully complete contracts to gain reputation boots and discover more clients, or mess up a flight and kill some Kerbals to see you reputation dip and have clients pull contract offers off the table. As expected for a major Kerbal update, First Contact also adds a new selection of components to use in your creations, as well as squashing some bugs. 64-bit support is now finally available, allowing the game to eat up more of that lovely RAM you have for a more stable experience. There’s no confirmed date for the landing of the update, but things seem to be going well, so expect it soon.